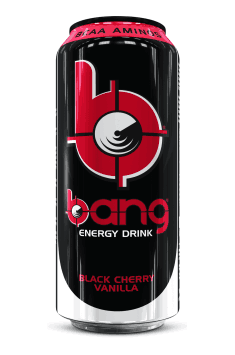 VPX Bang Energy Drink is a new version of the popular energy drink with a unique and improved formula. It characterizes with a significant content of caffeine – 160 mg in a can, the presence of BCAA, L-arginine and B vitamins, as well as a minimal amount of calories (just 6 kcal in a can). The combination of caffeine and BCAA effectively adds energy and reduces the feeling of fatigue, while supporting muscle recovery. Caffeine is a plant-based purine alkaloid that acts as a stimulant of the central nervous system. Caffeine's activity is based on several mechanisms. In one of them, caffeine is a non-selective blocker of adenosine receptors, which results in agitation, reduction of tiredness, improved clarity of mind, and the intensification of lipolysis in adipocytes. This way, caffeine supports physical and mental performance. It also inhibits phosphodiesterase, causing increased levels of cAMP in cells, which also intensifies lipolysis and stimulates metabolism. The increase in cAMP concentration prolongs the duration of action of catecholamines, e.g. adrenaline. BCAAs are branched-chain amino acids, which include L-Leucine, L-Isoleucine, and L-Valine. These amino acids have anti-catabolic activity and they support protein synthesis, resultant from the ability to activate the mTOR pathway. They have a beneficial effect on the nitrogen balance and they participate in the regeneration of glycogen. They are also a source of energy for working muscles, reducing fatigue and supporting strength and endurance. BCAAs are therefore an ideal solution for every active person. L-Arginine is a basic alkaline amino acid from which the body produces nitric oxide. Nitric oxide is a biologically active molecule that is of great importance for the heart and circulatory system. It reduces the pressure of blood vessels, regulating blood pressure, acting similarly to antiplatelet agents. It is nitrogen oxide that is responsible for the phenomenon of muscle pump. In addition, L-arginine has antioxidant properties. It neutralizes superoxide anion radicals and protects the lipids from harmful peroxidation. Vitamin B3 (niacin) is essential for the synthesis of NAD + and NADP +, coenzymes that condition many metabolic processes, including cellular respiration. Niacin and other forms of the vitamin B3 have a normalizing effect on the lipid profile. They lower the levels of triglycerides and VLDL and LDL cholesterol while increasing the level of HDL fraction. Niacin stimulates the production of antiatherosclerotic adiponectin. It also displays antioxidant properties, through an indirect influence on the activity of glutathione reductase. Vitamin B6 is a cofactor in more than 140 biochemical reactions, occurring primarily in the metabolism of amino acids. It is essential for the proper functioning of the nervous system. It has been shown that due to a deficiency of vitamin B6, aging of neurons accelerates and serious neurological disorders occur. The vitamin affects cognitive functions because it participates in the synthesis of neurotransmitters, including serotonin. Through participation in gluconeogenesis and glycogenolysis, Vitamin B also allows for an optimal use of energy supplied with food. Vitamin B12 is essential for the proper functioning of the hematopoietic system – it determines the proper production of erythrocytes. It enables the conversion of homocysteine ​​to methionine, leading to its lowering in the body. The methionine obtained in this process is converted into an essential donor in methylation reactions. By participating in the synthesis of choline and the nucleic acids that are part of the DNA, vitamin B12 is necessary for the proper myelination of neurons, optimal functioning of the nervous system and improvement of energy processes in the body. In summary, the VPX BANG is a unique product with an advanced composition compared to other energy drinks. In addition to natural caffeine, it also contains a number of compounds that support optimal use and production of energy by the human body. It is recommended in situations requiring a larger amount of energy, both physical and mental. It will also work well before a workout. Take 1 can always when you need extra energy. Do not exceed 1 can per day. Due to the high caffeine content and stimulating effect, do not consume the product in the evening. Avoid drinking coffee. The product is also a good solution before the workout, especially if no shaker and BCAA are available. Comfortable can, ideally suited to travel. The drink tastes best when chilled. Carbonated water, acids (citric acid), acidity regulator (potassium citrate, potassium phosphate dibasic, magnesium chloride, calcium chloride), sweeteners (sucralose, acesulfame potassium), preservative (potassium sorbate, sodium benzoate), flavorings.